Apple owned the lion's share of the worldwide tablet market in the first quarter of 2012 after shipping 11.8 million units, 11 times more than second place Samsung managed over the same period. According to analysis from ABI research released on Monday, strong interest in Apple's third-generation iPad helped the company maintain a nearly 65 percent share of the tablet sector which grew to 18.2 million worldwide shipments by the end of the first quarter. Samsung shipped 1.1 million tablets during the first three months of 2012, returning to the South Korean giant to the number two spot and displacing Amazon's Kindle which saw sales peter out after enjoying a strong holiday quarter. ?A pattern similar to smartphones is also occurring in tablets,? said Jeff Orr, group director of consumer research at ABI. ?Apple and Samsung have demonstrated staying power while other tablet vendors ebb and flow like the tide.? Apple managed to hold a majority of shipments after the company released a Retina Display-sporting model and dropped the price of the held over iPad 2 in March. Since the iPhone maker first introduced its tablet in 2010 over 67 million units have shipped worldwide. Despite shipping more than 8 times as many 3G-enabled units than its nearest competitor, Apple can't claim the crown of having the most mobile broadband users as iPad owners seem content to stay on Wi-Fi. It is unclear what is driving this statistic, but some assume that wireless carrier plan pricing may be a factor. Overall, the worldwide tablet was hit with a 33 percent sequential loss in shipments from the fourth quarter of 2011, though a year-over-year analysis showed a 185 percent gain for the sector. Of the major brand-name OEMs only RIM and Lenovo managed quarter-to-quarter increases with 233 percent and 107 percent, respectively. A number of manufacturers like Dell, HP and LG are readying Android 4.0 products for mid-year launches that are expected to fight over market share with upcoming tablets running on Microsoft's new Windows 8 platform. Apple recently received a green light to sell the iPad in China which is likely to boost sales substantially. The company is also rumored to be preparing a smaller 7-inch version of the device later this year. It's great to see companies getting ready to launch Android OS 4.0 now that it's getting close to being a year old. Andorid OS 4.x still only accounts for 7% of all devices while Android OS 2.x still accounts for 90%. That's worse numbers than when outmoded versions of IE were still reigning. We saw that the iPad made up 95% of tablet web traffic, didn't we? Well, now. …getting ready to launch Android OS 4.0 now that it's getting close to being a year old. It's hilarious. Is Google embarrassed about that? I would imagine anyone would be embarrassed about adoption numbers this low. How they know how many tablets Samsung shipped, as they don't give those numbers out, is beyond me. The other problem, of course, is the shipped vs the sold numbers that Apple releases. But it's more than that. Apple also gives us the number of days, or weeks, supply in the channel. When you add that number to the number sold, you have the number shipped. But no one uses that number from Apple. They just take the sold number and compare it to the shipped numbers of other manufacturers, using guesses for a couple of them as well (Amazon, Samsung). But it's more than that. Apple also gives us the number of days, or weeks, supply in the channel. When you add that number to the number sold, you have the number shipped. But no one uses that number from Apple. I'm curious: what is the ratio of sold/shipped for Apple? And how do these numbers correlate with the number of devices in use? I think the Ice Cream Sandwich melted before it could be served. I'm curious: what is the ratio of sold/shipped for Apple? Over a long enough time frame, the ratio is 1:1 - since virtually every thing Apple makes is sold. And how do these numbers correlate with the number of devices in use? It's not something you can easily figure out from published information because it depends on how long people use their systems. As a very rough estimate, make your best estimate of the average lifetime of the Apple product. Take the average number sold per quarter during that time frame and multiply. 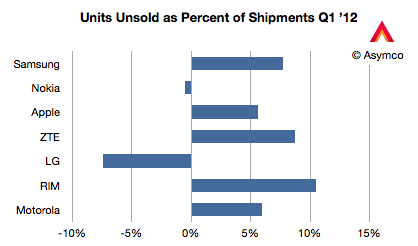 The sold/shipped ratio for Apple (iPads) is very close to 1:1. Mainly due to the fact that it's been almost impossible to get hold of an iPad by just walking into a store. Horace had a good article last week. Quarter to quarter, Apple gives various times for in channel supply. I don't remember the exact number given last quarter, but it's around 10 days. In order to do this correctly, I'd have to go and look up the numbers, as the selling period wasn't 90 days. But making some assumptions for the sake of the discussion, if there was 10 days in channel and Apple had a 90 day selling period, we would take the 11.5 million and decide it by 90, then multiply it by the number of days in channel, in this case 10. Then add that to the sold number, and you get the shipped number. In this hypothetical case, it would be 12,650,000.
Who cares about unites shipped? Of course, that's correct, but we see these numbers as a quarterly presentation. There is always product in channel. The question is how much. Apple tries for several weeks, usually between 4 and 6 weeks. But on very hot products, particularly for the first half of their full priced life, they can't meet that ideal. A week is the least I've ever heard them state in their quarterly conference call. He's always had some of the best analysis. Stunning just stunning adoption of iPad. I'm so proud to have joined the Apple family of products. So according to Horace at Asymco, both Samsung and Apple had approximately the same percentage of units "shipped but not sold", only a couple of percent difference. That's helpful in understanding where the players rate. That's strangely reminiscent of the XP scenario. There seems to be something about the non Apple market that likes to cling to legacy software. What's also interesting to note is that the companies whose sales and marketshare is falling seem to have zero to negative inventory as a result of cutting back severely in production. This is unusual. Except for poor RIM. They don't seem to be able to get things together. Their channel build out is much greater than their sales drop. As a result, they've declared another write off. This time for a billion bucks! So in less than a year, they've declared $485 million for Playbooks, $290 million for BB phones, And now $1 billion for more BB phones. Terrible for such a small company. I wonder if they will have another Playbook write down anytime soon. The problem for Samsung though is that the numbers aren't real, they're guesses as Samsung doesn't release these numbers. I would suggest RIM is close to the tipping point where the negative perception is retarding sales to the point of extinction. I would be highly surprised if RIM lasts 2 more years. True... but a week later there could still be a case full of iPads... but they would be different iPads. Doesn't Apple turn over its inventory, on average, about once a week? Who knows how many iPads are in the case at Best Buy... but a Best Buy store is open for 11 hours every day. I bet a couple iPads leave the store with a new owner, on average, every single day. With 130,000 iPads sold worldwide every day... a couple iPads from each Best Buy every day is certainly attainable. The bring this back around... I do believe the iPad shipping/sales ratio is 1:1. I've never heard of a store that had to send an iPad back to Apple because they couldn't sell it. I can't imagine a single iPad sitting on the shelf for longer than a week. In other words... I don't think a case full of iPads is bad.